My husband Petri Myllyneva and I would like to thank You for the fantastic concert on 10.12. We were very taken by the event. How wonderful it is to introduce music from different countries and have the young and talented people from the Prague conservatory to participate in the events. My husband had tears in his eyes to hear the Christmas carrols and especially, Finlandia. There are so many memories related to Finlandia, and it was very touching to listen to a young passionate Czech artist to capture the true spirit of Finlandia and build so much emotion to it. It was a very touching and beautiful occasion. Ambassador of Japan to the Czech Republic. 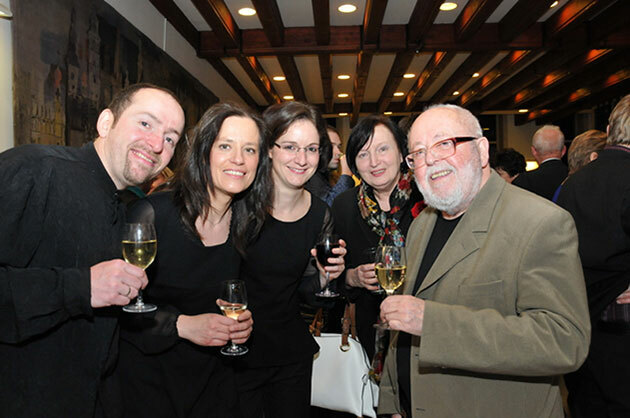 It is co-organized by Jednota pro zvelebení hudby v Čechách in cooperation with Prague Conservatory. Energetic, multi-talented Chuhei Iwasaki (1987) was born in Tokyo and studied violin at the Toho Gakuen Academy. 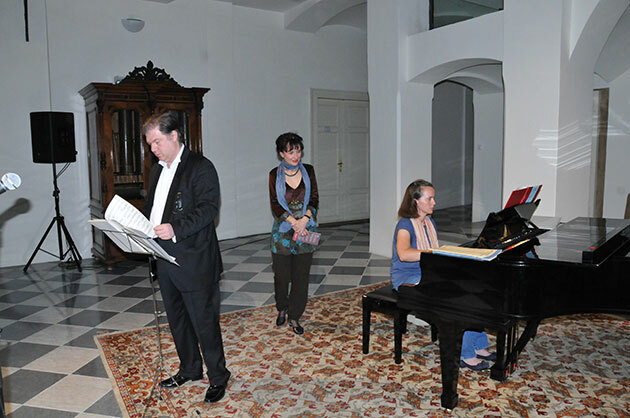 In 2006 he continued at the Prague Conservatory, also adding conducting and composing to his curriculum. Last year he entered HAMU (The Academy of Music), and in between his studies has found time to create the Iwasaki Philharmonic Orchestra; some of its members provide this evening's music. The versatile young artist also conducts the Film Philharmonic and is a guest conductor with the Talich Chamber Philharmonic and the Prague Chamber Philharmonic, as well as a guest choirmaster at various concerts and events. Pavel Trojan (1956) is also a graduate of Prague Conservatory and HAMU, and rose to his current post as Director of the Conservatory in 2004. He displays a wide range of talents as a composer of works for solo, duo, and multiple instruments; orchestras; film and theatre; operas; vocal works; and even instructional material. He has recorded on CD, served on several juries, and is active in several professional and music advocacy associations. It is composer and marimbist Miroslav Kokoška (1944-2005) whom we remember with this evening's focus on percussion. As a child he studied piano and violin, but by the time he graduated from Prague Conservatory he had found his 'voice' through percussion, particularly the marimba. Having acquired the largest concert model, a rarity in the CR at that time, he became virtually a self-taught marimbist who inventively moved the marimba from traditionally a percussion instrument into a melodic one, by employing four mallets, arpeggios, and three-part harmony combined with classical influences. He performed as a virtuoso soloist for chamber and orchestral music, earning the nickname 'the Paganini of the marimba' from several critics. His three concertos for marimba form the basis of Czech orchestral repertoire for this instrument. Believed to be the first musical instrument ever invented (after the human voice), percussion instruments are often compared to the human body – as 'the backbone' or 'the heartbeat' of an orchestra. This evening's program brings percussion out from the back of the orchestra to its rightful position on center stage. The Percussion Concerto(2005)by Pavel Trojan is presented in three movements, the first for untuned percussion instruments, the second for vibraphone, and the third for xylophone. Each movement takes us further on a journey exploring percussion. The opening movement is “a little bit dramatic,” the composer says, while the second, based on melody, may move some listeners back to a more traditional comfort zone. In contrast, the third uses “procedures which are closer to minimalist music,” he notes. 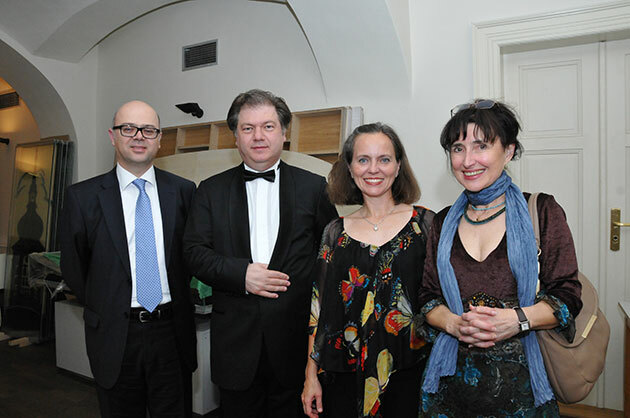 The concerto was composed for the HAMU diploma concert of noted percussionist Markéta Mazourová, and was subsequently recorded by Czech Radio. Composer Miroslav Kokoška once admitted, “I get most of my ideas while playing [music],” and in his First Marimba Concerto(1995) his spontaneity as well as rich musical background are readily apparent. A bit dissatisfied with the use of the marimba in largely non-melodic contexts of concertos written specifically for him, he preferred using the instrument to emphasize the emotional beauty of melody, such as in music given to us by Beethoven, Vivaldi, and Mysliveček, his favourites. The term Lisztomania might perhaps be also used to describe the brilliant ability of Ferenc Liszt to rewrite for his virtuoso piano show whatever he liked to play and promote, including his own pieces, such as the poems Love Dreams he made also into songs, having met new love in his life. His own transcribed symphonic poems include Mazeppa. What seemed to mesmerize romantic painters and poets (Byron, Hugo, Pushkin) about this late 17th cent. figure was the punishment he was subjected to in his youth having seduced the wife of a Polish aristocrat. He was strapped naked onto a wild horse which was set free to gallop across the wide plains of Ukraine. The victorious fanfare at the end of the music image is to announce that not only he survived in the legend, but later became the Cossack hetman of Ukraine. Those of the 19 Hungarian Rhapsodies that Liszt transcribed for piano, too, are technically demanding. They show inspiration in Hungarian folksong tradition, spread also by Gypsy bands, which inspired the founding composer of Hungarian music to use the dancing style of “verbunk”, with the slow “lassans” turning into the fast “friskas” (or the other way round), Gypsy scales, and improvisation. An invaluable musical bequest has been left by Béla Bartók who, since the early 20th century, was recording songs and dances of the neighbouring peoples as well, and further to the east and south, including Turkey and North Africa. His findings show that oriental roots of Hungarian music represent a distinctive feature in Middle Europe and are genetically related to those found as far as areas bordering on China. The For Children set comprises 2 volumes based on Hungarian, and 2 on Slovak tunes; Transylvania inspired his Romanian Folk Dances. In folk music, he discovered an untapped source of new creative ideas in style and form, and bravely began to develop them. His Piano Suite, written at the time of WWI, rather than citing folk inspiration, says goodbye to the ornamental romantic tradition, introducing new rhythms and bringing out piano´s percussive and expressive nature. Another new and distinctive musical expression was born at about the same time in Moravia with the work of Leoš Janáček (1854-1928) who, too, well before the First World War, began focussing and drawing on the folk song heritage in a new way. Motifs and style of the last two above mentioned composers provide a rich source of inspiration for the performing art of the Bardolino Trio not only at this particular ACS concert. Concert marking 55 years of diplomatic relations between the Kingdom of Morocco and the Czech Republic. The famous Moroccan vocalist Karima Skalli is often labeled as one of the most important Sufi singers in the Arab Maghreb (al-Magrib), i.e. the historical area, united politically and culturally, of Northwest Africa and Muslim Spain, the latter called al-Andalus. From the 8th century, Andalusia was a melting pot of intense cultural exchange between Christians (practicing Roman Catholicism and church singing with features of the Gregorian chant), Jews and Muslims. Andalusian classical music originated in Muslim Iberia and between the 9th and 15th centuries had become a tradition with different styles across the Maghreb, especially in Morocco. Historically, Sufism, a mystical dimension of Islam, gained adherents among Muslims soon after the birth of Islam, from the 7th century onward, maybe in reaction to the “worldliness” of the early caliphates. Devotional songs later spread from Syria and Iraq to the rest of the Muslim world and assumed local characteristics. In Asia, the tradition is called Qawwali. Sufi music has been inspired by the works of poets such as Rumi, Hafiz, Bulleh Shah and Khwaja Ghulam Farid. The focus is on seeking the right (individual) way to God. A typical feature is dance (e.g. the whirling dervishes). Sufi culture seems to be intriguing an increasing number of people in the Maghreb countries, including Morocco. Karima Skalli believes music plays an important role in finding the right path and promoting love and peaceful dialogue. She perceives creativity in her art as a religious moment with God, and she likes to share it with others. Born in Casablanca, Karima began singing traditional Arab music at a very young age. She studied classical Arabic singing at the Marrakesh Conservatory and after graduating, she won a national award of excellence in Arab singing. She started her career working with the Moroccan poet Abderrafie El Jawahiri and the oud player and composer Saïd Chraïbi. 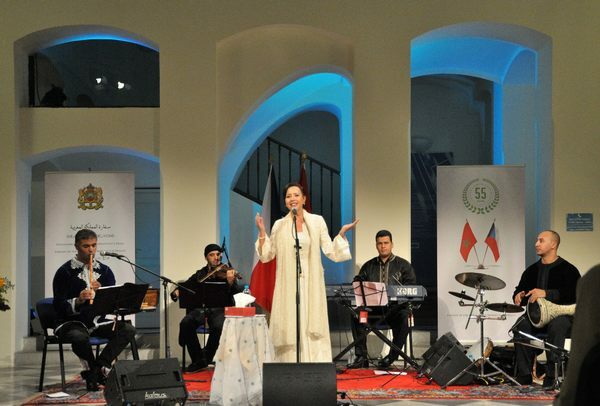 She regularly participates in the Fez Festival of Sacred Music and other renowned international festivals as well as important international cultural events all over the world, performing a repertoire of great Sufi masters. Accompanied by her group of musicians she always leaves her audience mesmerized by her beautiful voice and rendition of songs. Skalli has often collaborated with the Iraqi oud virtuoso Naser Chama and worked on many occasions with the Lebanese composer and musician Marcel Khalife. Mrs. Skalli’s Band is led by the flutist Rachid Zéroual who is a member of the Royal Orchestra and has won a UNESCO award for virtuosity on the eastern flute; he has continued the family tradition through his studies as well as concerts he gives internationally, promoting Moroccan music; pianist Mountassir Hmala is a professor of piano at the National Conservatory in Meknes and among other activities has performed with the orchestra Ismailia Meknes; violinist Younes Khazan is a professor of music education and a versatile musician who has participated in the development of several artistic projects; percussionist Tarik Ben Ali started at the Music Institute of Tétouan, where he learned the basics of percussion to become one of the best percussionists at the national level. 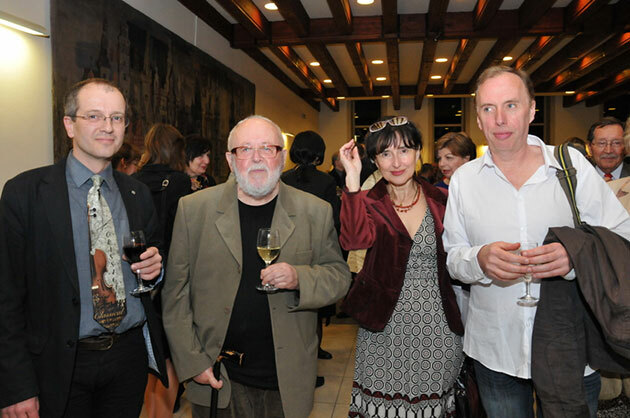 The „Turkish Dream“ concert of the 10th season of the Ambassadors´ Concert Series was held at the Czech Museum of Music at Karmelitska st, Prague 1 on 6.6. 2013 and was co-organized with the Embassy of the Republic of Turkey. This violin and piano recital was presented by two outstanding Turkish musicians, Cihat Aşkin – violin, and Zeynep Üçbaşaran –piano. The program started with lighter music by Necip Celal ANDEL (1908 – 1957) and the first Turkish tango. While this short composition followed the classic South American tango form, its rhythm and melodies were clearly Turkish - to Czech ears there was a lot of resemblance with Hungarian folksongs as used by Ferenc Liszt. It set a happy and joyous mood to the rest of the concert. Two Turkish folksongs (Blond Maiden and Dancing Girl) introduced a different genre of music. The first song that described the sadness of two cross-starred lovers was full of tender melancholy of forbidden love. Its sorrowful melody was typical of songs from the Black Sea region. The second song turned into a joyful melody of Azerbaijan circle dances with their captivating rhythms that invite the listener to join in the merriment. The program continued with W.A. Mozart’s Sonata for Piano and Violin in B-flat major „Strinasacchi“, K. 454 (1784). As a composition from Mozart’s virtuoso pieces – written for the outstanding Italian violinist Regina Strinasacchi with whom Mozart performed the premiere for Austrian Emperor Joseph II. Mozart wrote this music to display fully the brilliance of the violinist while creating a true dialogue between the two instruments. The performers perfectly captured the spirit of the work giving it a playful lightness and pleasure from sheer joy of mastering the demanding score with ease. Ferenc Liszt´ s Andante and Finale from "Reminiscences de Lucia di Lamermoor de Gaetano Donizetti" (1836) with its depiction of the utmost tragic fate of two lovers reflected not only Liszt’s full immersion into the heart-breaking story, but also the composer’s urge to demonstrate his exceptional technical skills with which he used to enchant his audience. The pianist lived up to Liszt’s intentions; her performance was stunning in its brilliance and in the eerie, sombre description of the tragic event. Liszt had performed the same extract for the Turkish Sultan during his visit to Turkey. Liszt’s choice of this piece for that concert might have been inspired by the fact that Gaetano´s brother was the court musician in charge of Sultan´s court music. Ahmed Adnam Saygun (1907 – 1991), one of the most important Turkish composers of the 20th century, wrote his Suite for violin and piano Op. 33 in 1955. While his music reflects the composing style and form of composition from the middle of 20th century, his melodies inspired by Turkish folklore are creative, powerful and self-confident, unique, without any resemblance to works by other composers from the same period. It is a pity his music is not better known in the Czech Republic! Antonín Dvořák´s Sonatina for Violin and Piano in G major, Op. 100 (1893) is joyful music. The musicians fully immersed themselves into Dvořák´s rendition of the transition from the pensive, at times even sentimental, spirit into sheer pleasure of life so typical for the Slavonic soul. The interpretation of this piece could not have been any better. The acoustic of the hall of the Museum of Music (former church deconsecrated during the period of Enlightenment) is perfect for performances of chamber music. 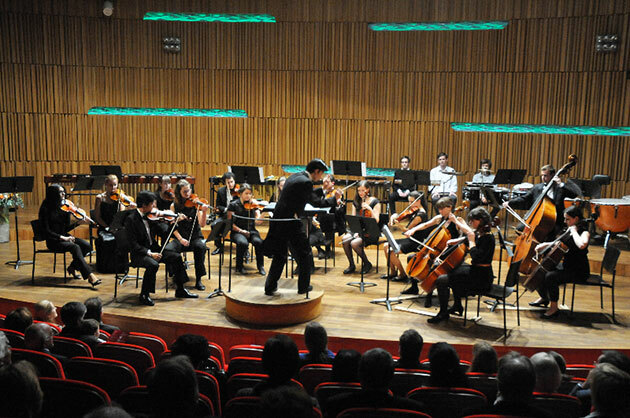 The performers fully used its quality to deliver one of the best concerts of the Ambassadors´ Series. Fortunately, the organizers filled the hall to full capacity (some 200 persons), and thus the enjoyment of this exceptional event was appreciated by many genuine music lovers and connoisseurs – as demonstrated by their enthusiastic applause. The Irish concert of the 10th ACS season was a celebration of works by contemporary composers performed by two excellent trio ensembles, the Irish Fidelio Trio and the Czech Janacek Trio. Present were also both of the representing Czech composers, Jiří Gemrot and Luboš Sluka, and one of the three Irish, Stephen Gardner, a native of Belfast living in Dublin. The latter was not in Prague for the first time and seemed to be enjoying the place also as a potential source of inspiration. The concert programme was conceived as a contrast between the different sources of inspiration: the powerful, unavoidable Czech music tradition on the one hand, here represented by two distinctive styles of Czech modern music, that of Janáček and of Jaroslav Ježek, and on the other hand, the inspiration derived from a wider context, spreading beyond Europe, and “traditionally” attracting Irish artists: the technique used to create the Bulb (by Donnacha Dennehy) draws on New York style minimalism, while How to make the Water Sound ( by Deirdre Gribbin) on Buddhist philosophy and Indian folk tradition. The last piece, Mayfly by Stephen Gardner, was a lively and spirited homage to the aviation pioneer Lilian Bland, the first woman to fly a self-constructed plane. Although her first flight occurred after fellow Luis Bleriot made a prior successful flight over the Channel, it took place near the site where the composer grew up as a child. This inspiration, from outside the field of music, is rather symbolic as it has to do with the Irish need to feel free: in movement and thinking and inspiration. This need seems to be peculiar to the Irish soul, and the composers featured at the concert, including the last one mentioned; it is interesting to note that he did not take an active interest in music until his early twenties. 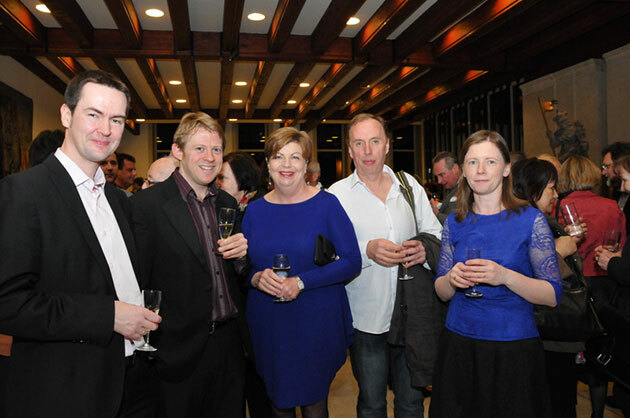 The CD was recorded by the RTÉ National Symphony Orchestra, and is available at Amazon.com.